As the US rehabilitates its relationship with Cuba, the world’s longest serving government leader ever is back in the public eye. Cuban autarch Fidel Castro is Public Enemy Number One no longer, though not for a lack of strength or savvy. After years of war, countless assassination attempts, and several life-threatening illnesses, Castro is still “full of vitality” at the ripe age of 88. His secret? 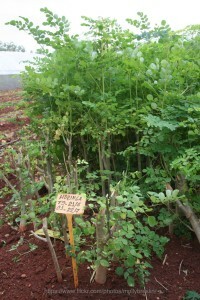 Moringa. In a recent and rare public appearance, Castro took thirty minutes of his time to discuss moringa, which he plants at his home in Havana. Addressing a column he had published in 2012 – mandatorily, by all official cuban media – Castro touted moringa trees and mulberry bushes as solutions to systemic food insecurity and underemployment faced by many Cubans. While I can’t say much for mulberry, I do know crazy old Castro is onto something with moringa! Eaten by indigenous cultures worldwide for thousands of years, Moringa is one of the most nutrient dense plants on the planet with high amounts of calcium, iron, vitamins, antioxidants, and all of the same essential amino acids as any other complete protein, like quinoa or meat. The tree is used by millions of people worldwide to gain the nutrients they need to thrive, and it is particularly well-suited for women and vegetarians due to its richness in calcium, iron and b vitamins, including folic acid. Castro even calls it a cost and energy efficient replacement for beef, eggs, and milk. The verdict is in that as the hungriest people grow food for a living, investing in agriculture is the most effective method of reducing poverty. With a little help from legends like Castro, raising awareness of moringa’s nutritional value will create a rise in demand and production, and consequential consumption will occur in the communities where it is grown. This creation of a market for moringa will create economic opportunity in the places it grows – often the poorest and most malnourished parts of the world. The moringa movement already has some pretty influential, if not controversial, leaders, including Castro and the late Venezuelan president Hugo Chavez. Both leaders swore by moringa during their battles with cancer. Though little effort was made during their times in power to revolutionize their countries with peace or a plant, it’s a powerful endorsement moving forward. It may just be Fidel Castro’s best idea yet. Is business the new destination for millennial activists?